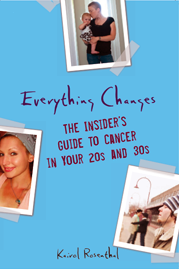 Everything Changes – The Guide to Young Adult Cancer » You’ve Got Cancer and A Teenager? You’ve Got Cancer and A Teenager? This quote from the first paragraph of Everything Beautiful in the World is evidence enough that it is time to ditch the didactic pamphlets from the American Cancer Society written for cancer patients who are raising teens. Pick up Everything Beautiful instead. Lisa Levchuk’s new novel for young adults is set in the 1980’s, but is no ABC After School Special. In addition to having a mother with cancer, 17-year-old Edna, the main character, is also having a fling with her fourth-period ceramics teacher. No, I’m not trying to scare you into home schooling your high schooler while you are going through chemo. I’m just advocating for giving your kids a real deal glimpse at the life of another teen (albeit a fictional one) whose parent is teetering on the fringe with cancer. Do you have any nightmares or success stories about raising your kids while you have cancer? What is the best advice you’d give to a recently diagnosed parent with teenage kids? While I was going through treatment and a stem cell transplant, my daughter ran the risk of not graduating from high school because she stopped doing her homework. She was using me as an excuse. I have no advice. Just the lesson that as a parent and a patient, I had only the illusion of control.